I’ve been seeing all sort’s of wonderful caramel apple treats lately and I wanted to get into the game, so I came up with a cookie version of those gourmet caramel apples that have been tempting me all season. It took me a couple tries to get them “perfect” but I finally came up with a recipe I liked. It made a firm, yet slightly sticky dough, filled with fresh apples. 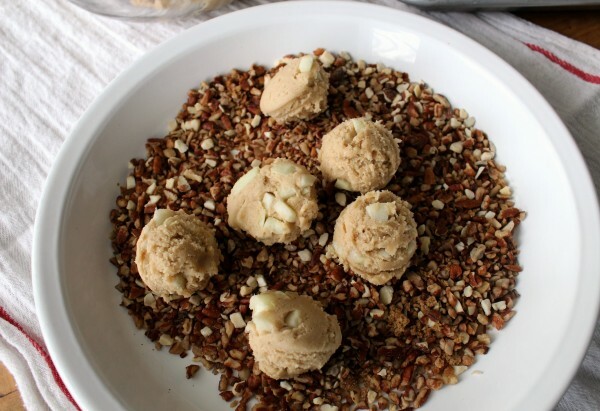 Using a tablespoon size cookie scoop, I made evenly sized cookies and rolled them in a mixture of pecans, almonds, and brown sugar. Even unbaked, they smelled wonderful! After baking, I used my cookie scoop to make an impression for the caramel filling. 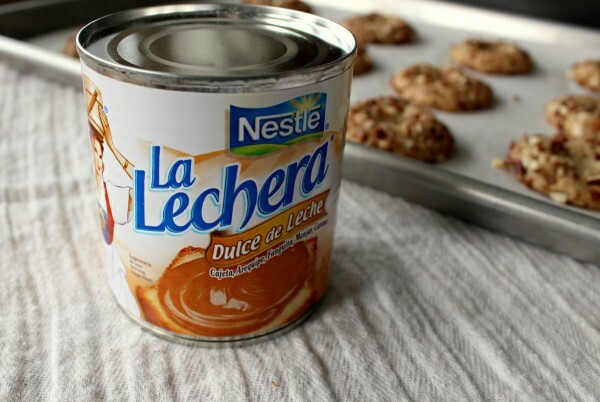 I used dulce de leche because it’s pretty firm and has a deep caramel flavor, however any caramel topping will work. and my icing bottles came in REALLY handy for drizzling them with chocolate. Not quite a caramel apple, but it may very well be the next best thing! This is a pretty good Saturday project so be sure to swing by the grocery store this evening if you don’t have the ingredients on hand. Have a wonderful weekend and a safe night of Trick or Treating for those of you who will celebrate Saturday. Cream together butter and sugars. Add the egg and flavorings and mix well. Sift together the flour, baking soda, and salt and set aside. Use one tablespoon of the flour mixture and toss with the diced apples until they are well coated. Mix in the flour until it is well incorporated, then add the apples. The dough will be sticky but firm. Next combine the mixed nuts with a tablespoon of brown sugar. 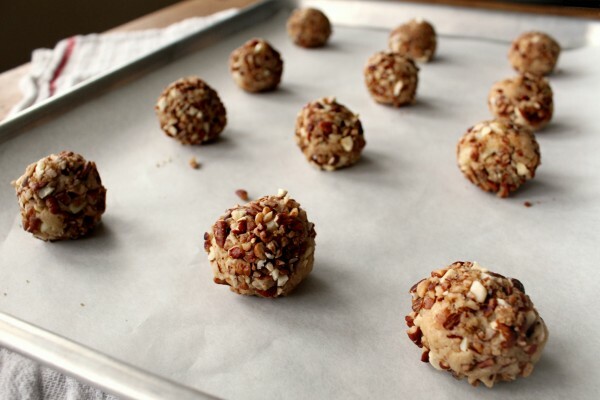 Drop dough into the nut mixture by the tablespoon and roll until well coated with nuts. Bake the cookies at 325 degrees for 15-17 minutes. 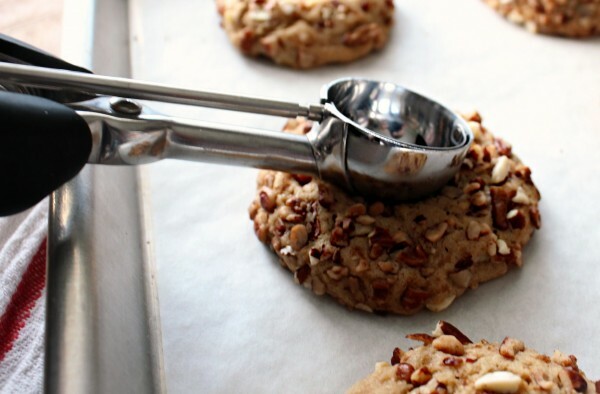 When you remove them from the oven use a cookie scoop or spoon to make an impression in the middle of the warm cookies. 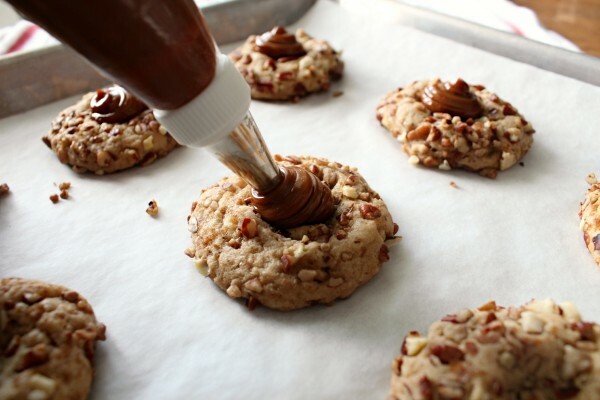 After cooling, use a piping bag to fill the cookies with caramel. 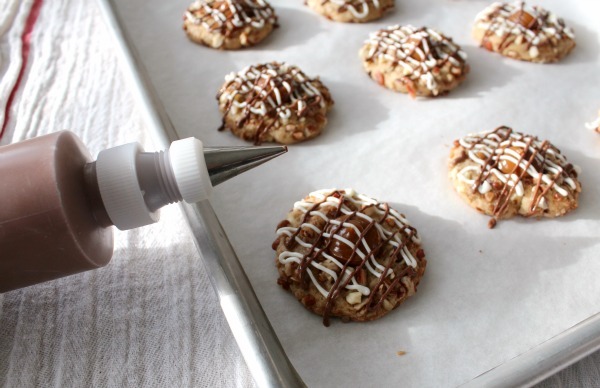 Drizzle the cookies with white and dark chocolate. If you would rather have the real deal, check out How to Make Gourmet Caramel Apples from Glorious Treats. If you need something a little stronger, I am loving this Caramel Apple Martini I saw on That’s What We Said! PS- you should make sugar cookies that are caramel apple on a stick shaped/design! Juuuuust saying. Don’t think that! I was mad because I WORKED WAY too hard….I saw your cookies and Naomi’s and was like CRUD, I made it SOOOOOOOOOOOOOOo difficult! These look amazing! 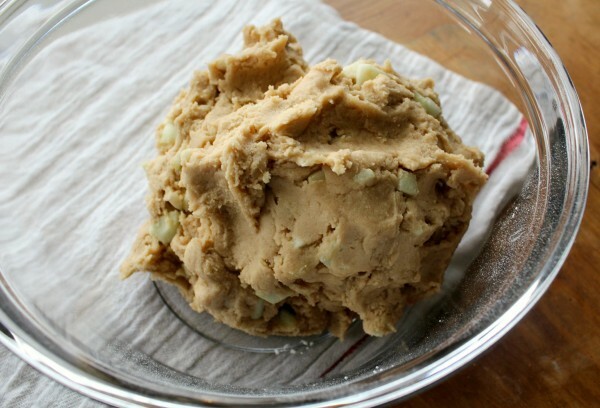 I made apple cookies recently, but I love the idea of rolling them in the nut mixture. Plus the caramel and the drizzled chocolate…divine! Oh, thank you. Those apples look tempting, but I know there’s no way I’ll make them. But this on the other hand… can’t wait for the baking smell to fill my kitchen. Wow! These look delicious Callye. 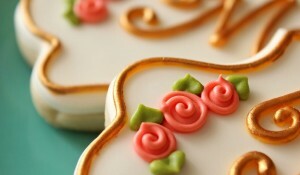 A sugar cookie decorator always feels that something is missing when they make something different. 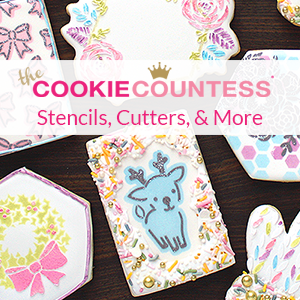 Glad you found a way to use your piping bags and squeeze bottles for these lovely little gems. Oh my goodness…they look so delicious…I don’t even want to know how many calories are in each one of those babies! Oh my goodness, those look so fabulous! Yummy!! I hope I have time this weekend – just got a gorgeous batch of apples from the farmer’s market, and I’m needing some caramel apple love. 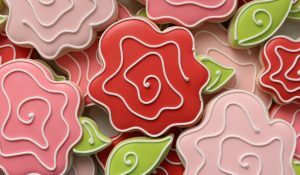 You rock – as usual! Uhmmmmm! I love Dulce de leche! Oh my. Oh. My. Word. Come to Mama you little pockets of apple and caramel delight. Mama will take care of you. And keep you safe in her belly. Oh mmmm you’re teasing me here. Not nice lol Caramel and apples in a cookie = perfect. Those look delish. We’ll have to leave off the nuts due to allergies but I’m going to try this for Thanksgiving! OMG these look good! I have a treat day recipe thanks! P.S. Though exciting, that game was a heartbreaker! Hopefully they prevail tonight! Carmel and apples — could anything be better? YES carmel apples from Sugarbelle! Gourmet is right! Aren’t these little cookies fancy? Love them! Pretty neat idea, i usually am not keen on eating apples on its own but this will be one way to try it out. these looks so good and pretty. you can make anything look pretty! Oh yes, send over a plate full of these beauties! Your recipe looks FABULOUS!!!! oh no you didnt bust out the leche quemada!!! Texas girl all the way, BABY! Oh my heavens do these looks scrumptious! Oh my gosh. These look incredible! I must make them!!! Thanks for the recipe, Sugar! I am on my way to the grocery store now. These look absolutely delicious! Callye, this is a GREAT recipe! 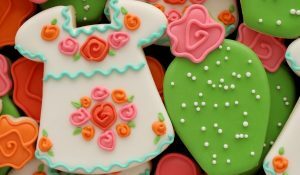 The cookies look irresistible delicious! What a great idea! These sound so delcious, I can’t wait to make them. These look unique and delicious! 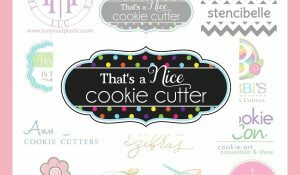 As your cookies always do! Callye – what a wonderful treat – I love caramel any way shape or form!!! Espectacular como siempre. Quiero ser tu vecina, amiga o tu compañera de trabajo… para comerme tus experimentos…. These look delicious! I can’t wait to make them! Thank you for the recipe! These are beautiful and right up my alley. I could use a few right now! 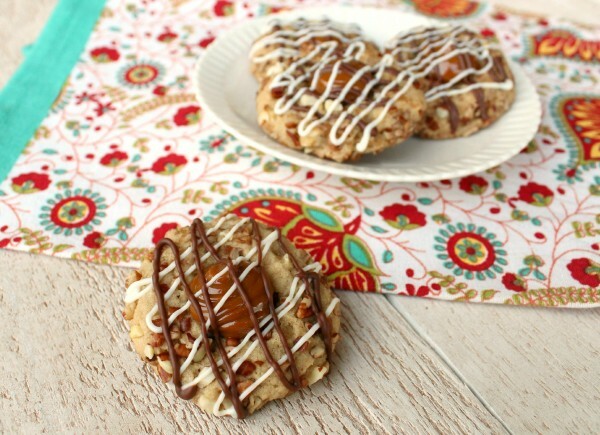 Pingback: Nutty Dulce de Leche Thumbprint Cookies | LimeJuice Sweet Treats – Addictively Delicious! Where do I store these once I make them? They look delish, gotta try!